Manipur elections 2017: The elections saw a voter turnout of 86 per cent. 39-year-old Oinam Kiran Singh drives an auto-rickshaw across Manipur's capital Imphal. Though he holds a Master's degree in Political Science, he has been driving an auto for the past 10 years to earn a living. "I could not pay bribe thus could not get job. There is no space for merit in Manipur, it's all about money. I want to see a government who will change this," Mr Singh told NDTV. The sentiment would make one feel it should be a cake walk for the BJP to dethrone the 15-year-old Congress rule in Manipur, but the case is completely different. "Even for the educated unemployed the issue of territorial integrity of Manipur is a major factor and chief minister Okram Ibobi Singh has been very strong on this. He has always fought the aggression of the Nagas and the NSCN (IM) who wants to create a Nagalim. Narendra Modi has signed a framework agreement with NSCN(IM) in 2015 and he came here and assured that there is no compromise with the territorial integrity of Manipur, but we are no convinced," Mr Singh said. This is where the Congress and the three-time chief minister Okram Ibobi Singh see a hope of coming back to power for the fourth term. On June 14, 2001, the Union government had decided to extend the ceasefire with the NSCN(IM) 'without territorial limits' to all Naga-dominated areas in the North East. This decision was perceived as threatening to the territorial integrity of Assam, Manipur and Arunachal Pradesh by the people of these states. This triggered widespread violent protests in the Imphal Valley, dominated by the Meitei community, and 18 lost their lives in police firing; the state legislative assembly was also set on fire. The then NDA government on July 27, 2001, reversed the decision. Land is the main trigger of all conflicts in Manipur - the Nagas resorted to economic blockade on the twin national highways which act as the main life line of the state. For over four months, essential item prices have been very high in Imphal Valley. "There is anti-incumbency against Ibobi but that's more among the Naga and a section of Kuki tribals and the urban people living in Imphal. That is not entire Manipur. I would not go with any of the exit polls, it's a fight between Ibobi and BJP and it can be neck-to-neck," explained senior journalist Sanzu Bachaspatimayum. There are 40 seats in the valley region dominated by the Meiteies and 20 in the hill region where Nagas, Kuki and other tribes live. 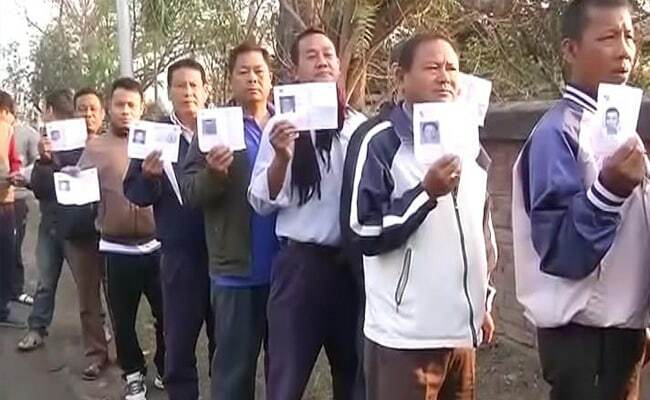 The BJP is hoping to get their government in the third state in the North East after Assam and Arunachal Pradesh, since the voter turnout has been large. They have reasons to hope, but numbers also give counter hope to the ruling Congress as well. The 2003 assembly poll saw a huge turnout of 90.38 per cent and the Congress got only 20 seats in the 60 member state legislative assembly. The Congress had to form an alliance government with the CPI and Okram Ibobi Singh became the chief minister for the first time. In the next polls in 2007, the poll percentage came down to 86.73 per cent and the Congress won 30 seats, and in 2012, 79.08 per cent votes were polled and the Congress swept the polls winning 42 seats. In these elections, the voter turnout is 86 per cent, giving hope to the BJP to come to power and Congress to survive.